The following comments about attractions in Ibiza have been posted from individuals. We believe that the best reviews of Ibiza, Spain are written by travellers and holiday makers who have experienced Ibiza first hand and want to share their thoughts. Can you share yours? 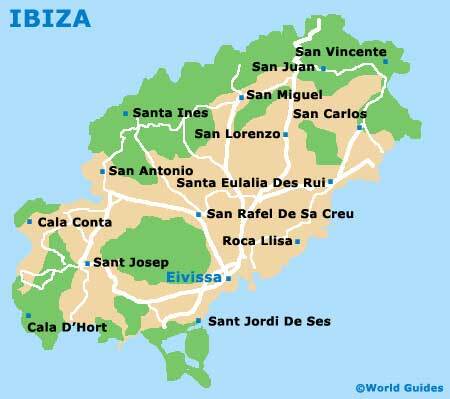 Please help us expand this section of our Ibiza World Guide. Let us know what you think about the attractions in Ibiza, Spain. Submit comments about Ibiza attractions here. Ses Salinas is one of the best beaches in my humble opinion. I think that it could easily be overlooked and we just stumbled upon it by chance. It was a really tranquil spot, with a good bar close by - the sangria was definitely flowing that day! The Playa d'en Bossa is one of the longest beaches on Ibiza and is the main beach for holiday makers. There is lots of accommodation close by and in the town. It is really good if you like a nice early morning walk, or if you prefer to sit back and contemplate life, the Playa d'en Bossa is lined by around 50 bars, yes 50! It is a very lively spot, and you soon get used to the occasional planes flying overhead, on their way to and from the airport. Ibiza Town is the capital of the island and has a quite historic area, around the city walls. These streets here are surprisinly narrow and when we were hear in the summer, they were quite crowded. However, this was not a bad thing, it was quite fun and made the ara feel quite 'alive'. There are lots of bars and restaurants with tables outside in the sunshine, particularly close to the Paseo de Vara de Rey. If you come to Ibiza and find it hard to leave the beaches and clubs, try to drag yourself away from the sunworshipping and experience a little of the history on offer here. # Directions: Located on the south west of the Island. Ibiza nightlife is powerful. Privilage is the best nightclub to go to as it holds the most party animals. Please note that these Ibiza, Spain comments and reviews are posted by individuals and are not necessarily the views of World Guides.